Maybe you are thinking that it would be very special to find this incredible place where you could take your loved one to for your Valentines day romantic getaway. But it would have to be a real treat, right? Believe it or not, there are some incredible destinations that are actually easier and less expensive to enjoy than you may think. It will not likely work for you if you wait and keep watching the last minute deals – you will be gambling and may end up not getting what you are hoping for. I have found a couple of great travel sites – Demeure and Jetsetter. Both list destinations that will satisfy even the most demanding traveler and give you incredible options in your search for the perfect romantic getaway. Mama's Picks: The most beautiful romantic Valentine's day getaways. I took some time and put together my Top Five Romantic Valentine’s Day Getaways, but I would strongly recommend that you visit Demeure Travel or Jetsetter and find out just how easy and worry-free it is to book your travel. Both travel clubs provide travel planning (such a great way to save time), great discounts and access to properties that aren’t generally found on other listing sites. When me and my husband plan a romantic getaway, there are a few things we want: a nice and cozy location, discounted cost, a show or romantic dinner planned for us, and a selection of wines. We only ever get to get away for a few days at most (3 days and 2 nights) so long term Valentine’s Day getaways are out of the question. Number 5 : Cellphones not permitted. Ali’i Villa is a perfect mix of luxury and casual elegance. 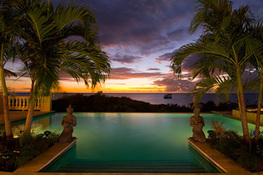 Imagine experiencing beautiful Hawaii sunset or totally enjoying outdoor volcanic shower. For those of you on the West Coast, Hawaii is only a hop skip and jump away. If you’re thinking of getting away to get the spark re-ignited (and taking a brief break from the day to day grind) then I would strongly suggest Hawaii. One of my personal favorites is an island sunset cruise. This is a perfect romantic getaway for sure. Spectacular mountainview scenery you can enjoy from your own pool is only the start of what this fantastic location has to offer. You can sit right next to #16 fairway of the Jack Nicklaus golf course and watch others golf. Or you can choose to participate by booking your tee times at a great selection of championship courses in the same area. After the game, you can cool down in the oversized pool, relax in a hot tub or sip a nice glass of something by your own fire pit . Me and my husband are golf fanatics, so playing a round or two of golf definitely fits into the parameters of a romantic getaway. Number 3 : Baby it’s cold outside. A great way to get some cuddle time is to go somewhere a bit colder and then just make sure there is a roaring fire and a bottle of good wine. I’m not big into skiing or snowboarding but Mountain Thunder, Colorado definitely gets the spark going. If you’re after a winter paradise with all the luxuries you can imagine – this “cozy” spot in the mountains of Colorado could be your favorite getaway for years to come. With 2,100 sq.ft. of living space, complete with fireplace and spectacular mountain view – Mountain Thunder. will not dissapoint. How could you not enjoy visiting this incredible place? Located near Scottosdale, this is truly a romantic and a true boutique style hotel. And they grow large portion of what they serve in their exclusive restaurant right in their own gardens! Speaking of the restaurant – Lon’s at Hermosa Inn, it is one of the last remaining original haciendas in Arizona. And what I really like about this beauty is that they welcome your furry friends – so you don’t have to worry that you spdcial four-legged buddy will have to spend time in the kennel while you are enjoying your romantic getaway! There is just something very special about Hawaii – maybe it is magic, I don’t really know. What I do know that you will experience something very close to magic, when you enter the spectacular, private and almost untouched by civilization Kona Village. This was formerly a fishing village, but these days it is miles away from being primitive. Located on the Big Island’s west coast, it will offer you all required elements for the best romantic adventure ever. And – no phones, no internet, no television… only you and your special someone, relaxing in a thatch-roofed bungalow by ocean view, that will take your breath away. Ahhh – I think I am in love….. Yes – this is the way to travel – hope you have enjoyed finding out all about these incredible locations. You will find more detailed information about these locations if you visit either Demeure Travel or Jetsetter sites. Have fun and have a very special Valentines day!